When we build a new website for a client, we build it from the ground up with SEO in mind. 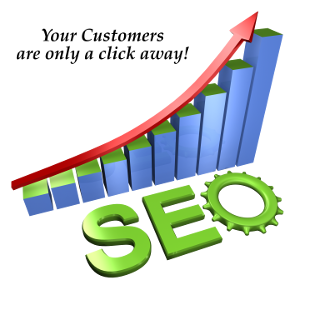 SEO stands for Search Engine Optimization. Search Engine Optimization is the process where we enhance your website to appeal to the search engines such as Google, Bing and more. You know that most people who search online will click on sites relevant to their search that appear on the first page of the search results. If the consumer doesn't find what they are looking for on the first page they will then proceed to the second page. Optimally you should be found on the first page of the search results thereby capturing that potential customer before they go to the second page or to your competitor's page. On-page SEO is the process of building your website in such a way that the search engines will show your website before others because it is more relevant to the search inquiry than other websites. These process's include things like keyword optimization, keyword density, high quality content, optimized meta descriptions, optimized title tags and much, much more! On-page SEO is built into every website we build, from the ground up. Our websites will be high quality and relevant for local search results. Not only will our website designs be crammed with high quality SEO but they will be high design and quite stylish. They will appeal to the search engines and to the consumer also. We strive to appeal to both! It doesn't do any good for you to have a great looking website if the consumer can't find it. Great looking websites don't appeal to Google. Great SEO appeals to Google. If your SEO strategy is sound, then the search engines will rank them higher. The higher the website is ranked, the higher it will be found in the search results thereby being more visible to more potential customers. Our On-page SEO comes with every website we build. Both for the Basic Website Plan and the Managed Website Plans. With the Managed Website Plans, we incorporate Off-Page SEO along with ongoing On-Page SEO to build a local powerhouse of a website. Most website design companies will build beautiful websites but they won't be optimized for local search. This process can be very time consuming but pays for itself many times over in local search ranking results. Our time honored methods of On-Page SEO are constantly being revised to adhere to the changes in the search result algorithms. When you purchase a Website Plan from LMS Website Services you can rest assured that your new website will be built with high quality On-Page SEO that is up to date and follows the white hat methods that create a sustainable website presence.